← They Always Come Running Back.. This picture speaks more truth then a lot of people may realize. I once was out to dinner with a guy that I had been spending a lot of time with and he treated the waiter like he was the scum of the earth. Now let me add that I have had my share of times where I have been rude to a waiter or waitress because they have been actually horrible at their job. However, he acted this way at a restaurant every time we went. 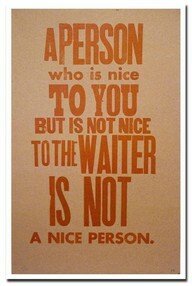 There is absolutely no excuse to be rude to someone just because their job is to serve you. Until I had gone out to dinner with this guy I had thought he was such a sweet guy he treated me like a lady and opened the door for me and everything. After seeing how he acted towards other people I began to wonder what was I willing to give up to be treated like a lady? I was not willing to be walking around with a guy that opened the door for me and then practically slammed it in others faces. I wanted a guy that would open the door whether it was for me or if it was for a bum off the street. I am looking for a guy who is kind all around not just to me. In reality what makes a guy special? His thoughtfulness, kindness, masculinity, and some possibility of romance. Now if I find a guy like that I want to be able to tell all my friends about him and all the great things he does. Now when my friends meet him I want them to see the great things I have said in action. All in all, I want a guy who will treat others the same way that he treats me. I think that this is an important life lesson for men and women. I only speak from a girls perspective because thats the perspective I know. Something else that I know is that both men and women deserve kindness and respect. So we all need to think about how we treat others. I know I will because when I go out on a date with someone I pay attention to how they are acting towards me and others and I want the kind of guy that people tsay wow what a gentleman!